At GA this year, there will be multiple programs to provide resources to congregations for the development of vibrant, meaningful worship services that are intergenerationally and multiculturally inclusive. 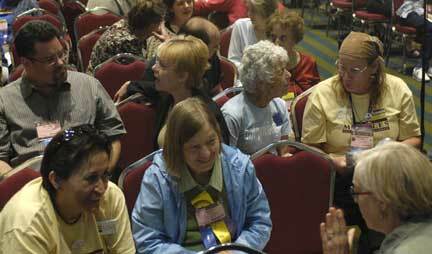 Engaged GA attendees at a 2009 workshop. Skinner House authors Mark Belletini, Wayne Arnason and Erika Hewitt will share their own experiences as worship planner and leaders, exploring successful strategies as well as missteps. Topics include intergenerational worship, prayer and meditation, alternative worship formats, new music, small group worship and more. Through song and story, the Council for Cross-cultural Engagement examines respectful use of worship materials from many backgrounds and cultures. We will explore how congregations can increase cultural awareness in worship and build stronger relationships in the larger community. Active participation within our gatherings is key to vibrant communal experience. Music, movement and silence each offer powerful opportunities to engage participation. With a focus on ‘take-home’ learning, we’ll celebrate a short worship service, then explore together both the how-to’s and the conceptual grounding of what we’ve experienced. A sharing of stories from contemporary experience, our history, the imagination and real life—stories useful in Sunday worship, as religious education resources and for personal meditation, stories that celebrate our deep affirmation that “Love Saves.” Drawn from stories the Universalist Heritage Foundation is gathering for an upcoming anthology. More than preaching, music, and education in a cross-cultural context, multicultural UU worship offers vital spiritual formation for congregational ministry while modeling and celebrating the sacred. Worship with us. Learn how presenters including Rev. Leslie Takahashi Morris and Rev. Nancy Palmer Jones are transforming worship to reflect multicultural UU community. Singing Meditation is an alternative form of worship that alternates repetitive singing of short, simple, interfaith songs with periods of undirected silence. Workshop includes brief lecture about the universal appeal of song and silence across cultures, the basics of starting a group, and concludes with a singing meditation session. Is your congregation seeking ways to enrich spiritual depth by crafting engaging, creative worship services for all ages? Come explore the key characteristics of dynamic, story-based worship services, as we go through the steps of creating one (in small groups) from opening words to benediction. A vibrant movement of UU musicians is creating new music with relevant messages, inclusive of all and inviting to younger generations. Jim Scott, and friends Amy Carol Grant, Rev. Fred Small and Matt Meyer will raise the roof, celebrating our ideals and demonstrating song-leading techniques to enrich our worship. Easy effective ways for congregations to be more inclusive, live out UU values, and make themselves welcoming to non-Christians. Participants learn the basic Jewish scriptures: Torah, Tanakh, Talmud, Mishna, and Gomorrah. Examples of wisdom in each that can enrich UU religious services. Jewish holidays and observances to enrich UU worship. Two years ago the office of Worship and Music Resources came into being. What’s happened since, and what might happen going forward? Come learn how you can help weave a strong and beautiful web of resources to deepen the worship life of our congregation. Hear about ways to bring contemporary worship into your congregation. Our speakers will talk about how to create new worship opportunities that satisfy young adults and how to bring contemporary worship elements into your Sunday morning service.